It’s Flank Steak Tacos with all the feels! 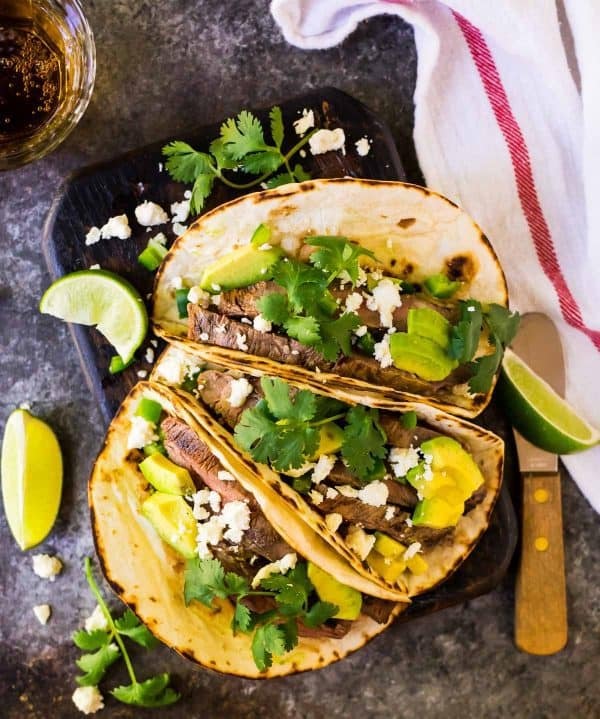 This recipe starts with an easy citrus marinade, reaches its midway point with soft tortillas stuffed with the most tender, juicy strips of flank steak, and ends with you licking your fingers and congratulating yourself on being a Tex-Mex master. It’s a minimal prep, maximum dinner accomplishment and reminded me of how rewarding it can be to try new things in the kitchen. When I bought our outdoor grill back in the day, I had thought that Ben would take over. The grill is a man’s territory, right? NOPE. Ben usually doesn’t make it home in time to cook dinner, and even when he does, his role is usually keeping me company in the kitchen, then helping wash up afterwards. Rather than let our grill wither away, I decided to fire up the grates and teach myself how to grill. I started with easy recipes for grilled vegetables (Grilled Cauliflower Steaks, Grilled Portobello Mushrooms, Grilled Corn Salad), eventually added on quick-cooking proteins (Grilled Shrimp Seasoning), and then migrated to simple skewers or foil packs (Grilled Orange Chicken, Grilled Chicken Fajitas). Meat, however, intimidated me. Especially steak. Especially cuts of steak I didn’t usually grow up eating (ahem, flank steak). Then one fateful Saturday morning, I watched Bobby Flay Flank Steak Tacos go down on the Food Network. I decided it was time to push myself and try something new. I’d never grilled flank steak before, but Bobby assured me that it was easy and forgiving and that as long as I let the flank steak rest and sliced it against the grain, I’d be in good shape. Even if you’ve never grilled flank steak before, you can make these quick Flank Steak Tacos. 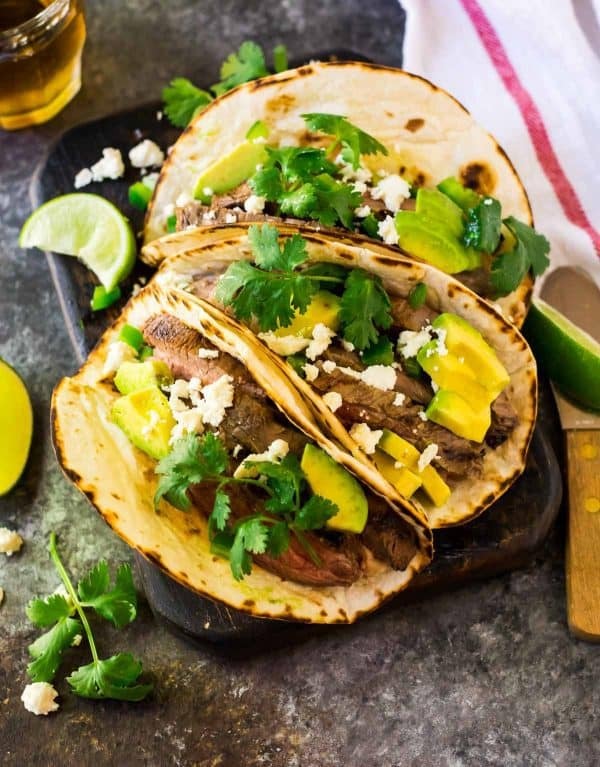 Even if you don’t have a grill (or if your grill is covered in 18 inches of snow like ours is at the moment), I have recipe directions for stovetop Flank Steak Tacos and Flank Steak Tacos in the oven listed below too! These are the best flank steak tacos. They’re easy, tender, and will bring a taste of sunshine into your kitchen, along with a (well-deserved) sense of swagger to your cooking routine. Citrus juice. Go for a blend of orange and lime. Good old-fashioned S&P. Salt and pepper forever. Since there are so few ingredients in this recipe, be sure to use freshly squeezed orange and lime juice (this citrus press will be your friend). The bottled stuff will throw off the Flank Steak Tacos’ flavor. Friendly suggestion: pick up a few extra limes and oranges so you can sip on a Skinny Margarita while the tacos cook. You’ll be pleased you did. Quality comes into play with the flank steak itself too. Flank steak is one of the most affordable cuts of steak you can buy. I like to get ours from a grocery store whose meat department I know does a reputable job sourcing its ingredients. You don’t need to break the bank, but beef is an area where you want to buy the best that fits your budget. Next, let the flank steak marinade do its thang. The flank steak does need to marinade for at least one hour, but if you’d like to prep it ahead, you can let the steak rest in it for as long as eight hours (don’t go longer or the citrus will actually start to break down the meat). For ultra quick flank steak tacos, you can prep the marinade and store it in the refrigerator the night before, pour it over the flank steak before you leave for work, and then come home and the meat will be ready to go. Although you do need to build in time for the marinade portion of the recipe, the good news is once that hour is up, flank steak is freaky fast. The steak cooks in less than 10 minutes. You can scale this grilled steak taco recipe up or down to suit your needs. If you have leftover flank steak tacos (we did), I suggest gently reheating the pieces of steak in a lightly oiled skillet, just until warmed through. You can also cut leftover steak into smaller pieces, heat it quickly in a skillet, then mix it with warm beans, rice, and your favorite Mexican toppings to create steak burrito bowls. I know it sounds trite, but trying this recipe brought me joy and reminded me how important it is to continue to learn new things. 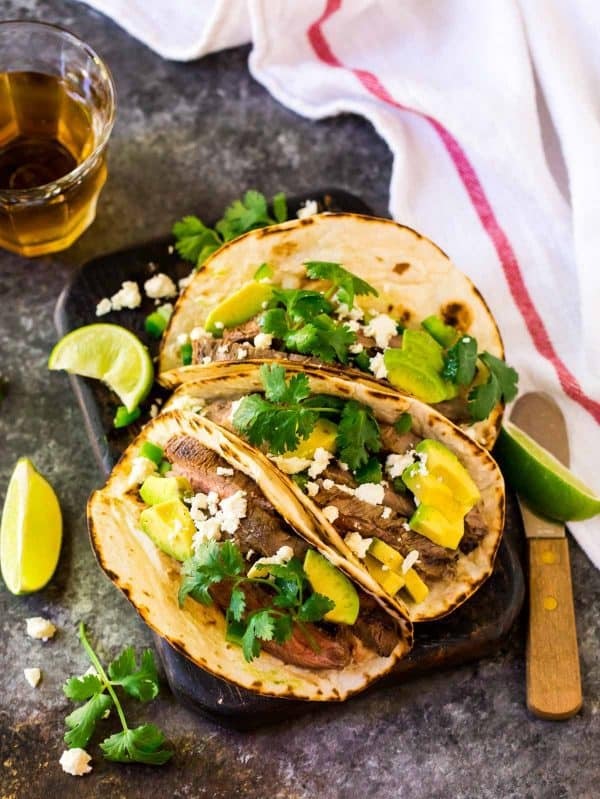 Whether you are already a flank steak cooking pro or looking to make Flank Steak Tacos for the first time, I know you are going to love this recipe. It’s simple, flavorful, and a beautiful reminder that home cooking doesn’t need to be difficult to be delicious. If you are cooking on the stovetop, I love this cast-iron griddle. Citrus press. You’ll be amazed how much you can squeeze from every lemon, lime, and orange! Instant-read thermometer. The best way to ensure you don’t overcook your meat. A recipe for quick flank steak tacos with an easy citrus marinade. 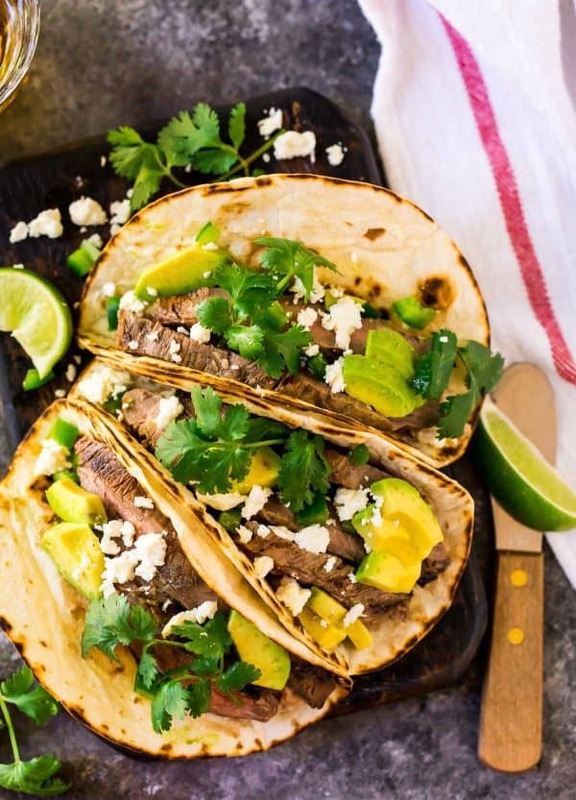 Use this recipe for the best, most tender grilled, stove top, or oven flank steak tacos! Place the flank steak in a baking dish. In a medium mixing bowl or large measuring cup, stir together the olive oil, garlic, orange juice, lime juice, cumin, salt, and pepper. Pour over the steak. Cover tightly with plastic and refrigerate for at least 1 hour or up to 8 hours (do not marinate for more than 8 hours or the steak will break down and soften too much). When ready to grill, remove the steak from the refrigerator and let stand at room temperature while you prepare any toppings and preheat the grill. Preheat an outdoor grill or indoor grill pan over medium-high heat (alternatively, you can cook the steak under your broiler—place your oven rack in the upper third, usually the second closest rack to the top). Brush the grill grates with oil. Remove the steak from the marinade, shaking off any excess. Grill (or broil) the steak for about 3-4 minutes per side, flipping once, until medium-rare (The steak should read 135 degrees F on an instant read thermometer.) Remove the steak to a cutting board and cover with foil. Let rest for 5 minutes (this allows the juices to sink into the meat), then cut the steak into thin, 1/4-inch slices, slicing it across the grain. To heat the tortillas: place them in a dry skillet heated over medium-high or heat them on the grill for about 30 seconds per side, until warmed through. Assemble the tacos: fill the tortillas with a few slices of beef. Sprinkle with cheese and any desired toppings. Enjoy immediately. Nutrition information is an estimate and has been calculated with half the total marinade, as much is discarded. If you would like to calculate it differently, you can do so for free at myfitnesspal.com. This looks really nice…I love trying different ingredients in tortillas. We prefer flour ones in most dishes. To me, you can do so many things with them. They’re like using bendy pizza dough – anything goes! Hope you have a nice weekend with this perfect weather. Such a great analogy Chris! This recipe is delish with both corn and flour tortillas, so pick your favorite. Happy Friday! Also try using flat iron cut even more flavorfull, or the ultimate skirt steak. If you try the skirt steak you will need to cut it into smaller pieces almost like a very coarse ground beef. The flank steak and the citrus marinade are a match made in taco heaven! Just beautiful. Love the flavors. Anymore, if I’m using a flank steak, flat iron, hanger steak, skirt steak…. I sous vide it. Since these tougher meats come out like butter, they’re easier to eat in tortillas, where you’re using your teeth and not cutting first. But the recipe doesn’t have to change. I love Bobby Flay as well! Mimi, I haven’t tried sous vide yet, but I’ve heard amazing things! I need to try it sometime soon. SIGN. ME. UP! These look INCREDIBLE! I’ve just started cooking flank steak again. The marinade is key and you can do so many different things with different marinades. This looks delicious and I can’t wait to try it.